There are several Catalina Island hotels with ocean view and the island has all sorts of high-class hotels for accommodation. Although the island is a perfect place to be on your next vacation, you might place a lot of importance on the view from your room. For many visitors, a stay in Catalina Island would not be complete without a view of the ocean and beaches. 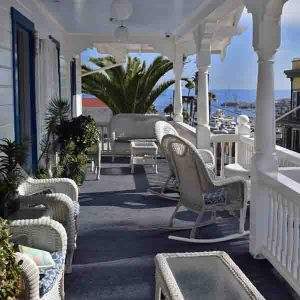 Catalina Island hotels with ocean view come in all shapes and sizes. They can be found in both Avalon and Two Harbors. Avalon is a center with different activities from restaurants, shopping, and nightlife. Two Harbors has a very quiet relaxing environment where you can relax and unwind. If you are like many people who prefer a hotel with an ocean view, however, then Avalon is the place to be. In this case, the most historic area works great for capturing the view everyone is seeking. Everyone seems to enjoy a view overlooking Avalon Bay. This is why some of the older hotels in Avalon offer the best views of the ocean right from the balcony of the guest room. 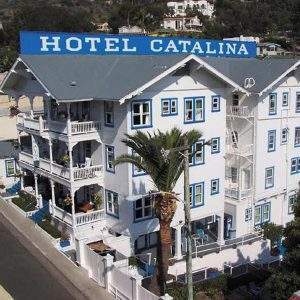 Our featured choice of Catalina Island hotels with ocean view is the Hotel Catalina. This beautiful oceanfront hotel was built in 1916. The hotel has been renovated with modern building materials to bring you that blue and white fine touch. It is found a few steps from Avalon Bay where you can have a tranquil harbor view from your balcony. As you take in an ocean view and the surroundings, the nostalgia of the area seeps into your soul. You can feel the antiquity of your surroundings and relish in thought of days gone by. You can also relax and have a cool afternoon in the beautiful garden courtyard. The chairs and the tables provided in the courtyard provide you with all manner of relaxation you might be dreaming of. There is even a Jacuzzi to further add to your enjoyment. Hotel Catalina has three floors with a total of 27 rooms and each has a unique eye-catching viewpoint. There are both ocean view and mountain view rooms that keep you glued to the outdoor natural beauty. If you prefer an ocean view with private balcony, be sure to book early to secure your reservation. The hotel also has cottages including family cottages with a spacious kitchen and a romantic cottage for honeymoons. Some of the rooms come with a high-class in-room feature which includes a 32’’ flat screen TV with a DVD for your entertainment, free WIFI, and a refrigerator. Hotel Catalina provides you with a variety of rooms to choose from depending on your preference. A spacious standard room on the 1st floor has a queen or a king size bed, a bathroom, wooden finishing including a wooden floor to keep you warm. Apart from a standard room, you can opt to have a standard room with a courtyard view. You can also choose a Mountain View room located on the 2nd and 3rd floors. A family cottage room is very ideal for a family setup with children it has a full kitchen. For people who need to have a private moment together, a honeymoon cottage with a parlor is for you. Hotel Catalina is a perfect place to relax with your loved ones. If you are visiting as a family, on a honeymoon, or for a meeting, Hotel Catalina has you covered. Likewise, they can help you with group meetings and events you many be organizing. Finally, you can get up to a 10% discount on food and adventure tours by visiting the Hotel Catalina. This Catalina Island hotel with ocean view is an old-made-new hotel. Hotel Catalina combines a historic building to a well-furnished hotel with modern amenities. It is easy to access from Avalon harbor with a range of transportation from private to public that can take you directly to the hotel. Experience a taste of history and catch a glimpse of the past in this well-known landmark hotel!